Marlyn Lodge proud to 'join forces' with Anytime Fitness! New Year’s resolutions don’t just have to be for January…! We know it can be important for some of our guests to keep up with their fitness regimes and a visit to London shouldn’t have to get in their way. Our guests now have the luxury of purchasing their own £5.00 gym day-passes from Anytime Fitness – a deal for our guests only! (Standard rate day passes £9.95). A short three-minute walk around the corner from 2 Portsoken Street and you can find this friendly, professional 24 hours a day* gym at 18 Alie Street, London. Just pop in (during staffed hours), quote Marlyn Lodge, purchase your pass and away you go! The gym features free weights, squat racks, barbells, dumbbells, battle ropes, medicine balls, kettlebells, skipping ropes, treadmills, cross trainers… the list goes on! Everything you need to stay fit and healthy this year whilst enjoying your stay with us in London! Visit their website for more information. *Please note to purchase your pass you will need to go in during staffed hours. As the cold nights of December loom closer, you may be thinking it’s far too late to book your cosy Christmas stay in the great city of London but fear not – there is still time! If you want high-quality, affordable accommodation in an unbeatable location then choose us today and you won’t regret it. You can book with us and spend your wintery days Christmas shopping in the thousands of shops across the city. The famous Oxford Street is easily accessible from our apartments and you will be spoiled for choice with the amount of stores on the high street, whether you’re looking for designer gifts or budget bargains – there really is something for everyone. A half-hour tube journey will take you there and you can find shops such as Selfridges, GAP, Mango, John Lewis, Primark and even a Disney Store where you can pick up perfect gifts for the kids. Many of the shops stay open until around 8 to 9pm with most bars and restaurants staying open until late also. When visiting Regent Street, you’re already in London’s West End so you can easily go and enjoy a theatre performance or a lively show and make the most out of your visit to the city. You might not even have to shop in London to indulge in the Christmas spirit – the Oxford Street Christmas lights have been glittering proudly since the 7th of November and will stay up until the 6th of January. An outstanding 750,000 bulbs will illuminate your way through the streets so you can shop (or not!) in style. Regent Street is also glowing in seasonal bliss with an impressive 300,000 lights so why not grab a mince pie and take a nice stroll. You can reach this winter wonderland within a 15 minute tube ride from our apartments. Why not experience the Shard’s annual Christmas Light Show this December (4th – 31st) and watch the capital’s night sky light up in a fantastic festive show, from dusk until early morning. The Shard will have special displays on the opening night and New Year’s Eve so don’t mind this wonderful opportunity while you’re in London. Like we’ve said before, it’s not too late to book! Our affordable accommodation will be a great choice for those looking to have that home-away-from-home feeling, or looking to relax over the winter holidays, or even those wanting to splash out on all those shops – our apartments will be a great home base for you! Many of our previous guests will already know that our superb location is one of the main reasons they decide to choose us when booking their serviced accommodation in London. 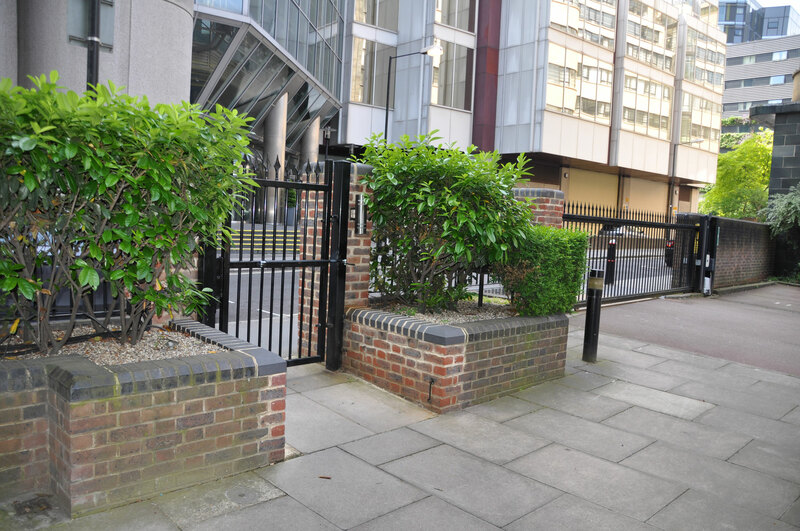 Located within a five-minute walk of both Tower Hill Underground Station and Aldgate East Underground Station, alongside a twenty minute walk from London Liverpool Street Station, we have great connections with the huge public transport system that London has. 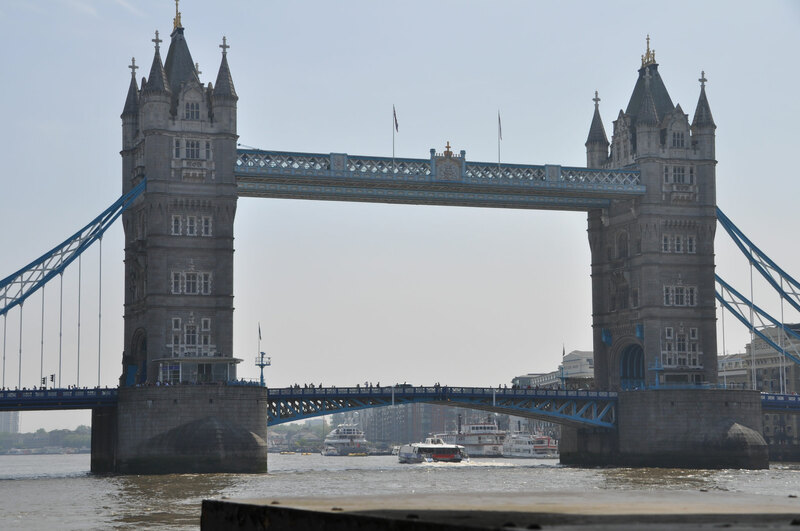 This ensures our guests can get the most out of their time in the city, especially those looking to do some sight-seeing - you can even walk to Tower Bridge in around 10 minutes from our apartments - perfect for a charming autumn walk! As London is such a large city, it is vital to be well-connected to public transport and this could be an important factor for our business guests. The Tower Hill Underground Station is on both the District Line and the Circle Line, connecting to all areas of London and the West End. The DLR can be a convenient choice to travel to either the ExCel centre or Canary Wharf. Not all of our business travellers will need these great transport connections however, as we're moments away from the Lloyds of London and in the square mile already. Of course, with a large city comes copious amounts of things to do and see so being able to travel to the other side of London conveniently and quickly is critical to take advantage of your time here. Choosing accommodation with the perfect location for you may sound unrealistic or perhaps expensive, but not when you book with us. When looking for a good location in accommodation, it may also be essential for some visitors to plan how to travel to and from the airport at their chosen accommodation. 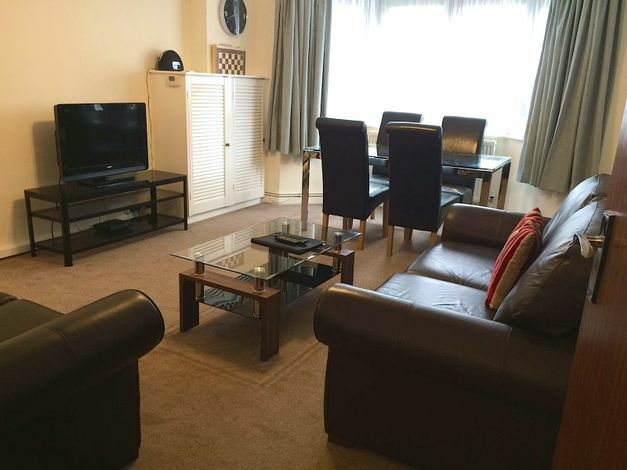 Our apartments are easily connected to all the rail stations linked with the major London airports - Heathrow (to London Paddington), Gatwick (to London Victoria), Stansted (to London Liverpool Street) and Luton (London St. Pancras). All of the above stations can be reached by the two underground stations closest to us, so you don't have to worry about a long, stressful journey finding your apartment or on the trip home. Depending on the size of the group travelling, we recommend using a private car for transport from airports - it may be cheaper and easier, especially for groups of 3 or more people with luggage - allowing you to spend more time enjoying the city. As mentioned in our previous blogs, we also have a fantastic location for local pubs, bars and restaurants - you can read more here - and we think this is just as important as other factors when looking for quality serviced accommodation in the city of London. You may not always want to use public transport when they just want to grab a quick bite to eat or an evening drink, and you won't have to when you book with us. Here at Marlyn Lodge we know that location is extremely important and we couldn't be prouder of the outstanding location that our serviced apartments have. We hope this blog has given you an idea on why location is important and how our apartments may be just what you're looking for. Don't miss out on a great deal, book with us now. With winter nights looming in ever closer and the frosty chill in the air, perhaps you would appreciate an evening out with good friends, family, a warming atmosphere and fantastic food. Of course you are absolutely spoiled for choice in a city like London so we thought we'd single out a few places you could go near our apartments. Named after the last three noblemen beheaded in Britain, The Three Lords is a popular modern pub for everyone. Located on Minories, just around the corner from Marlyn Lodge, this public house features a vibrant, friendly environment enriched with local history and an astonishing selection of food and drink. Currently they are offering any main meal and a drink for just £10.00 on Mondays, available both lunch and evening service times. The cuisine is delicious and healthy home-cooked Asian food, and take away is always available if guests fancy bringing the food back and eating in instead! Wednesday is Wine-down Wednesday and you can get £5.00 off every single bottle of wine. They also show live sport in the main bar and are very proud of their well stocked bar, with over 20 whiskeys, 20 wines, craft beers and many, many more. For our business guests, you may be pleased to hear that this particular pub is even available for hire of informal business and group meetings - a perfect place to unwind! You can find more information on their website. The Oliver Conquest is another pub and gin house located nearby our apartments, found on 70 Leman Street. Proudly obsessed with gin they are home to over 350 different types of the drink. For those not a fan of the juniper berry spirit, you'll be pleased to know they still stock a fine selection of beers, wines and soft drinks. In the pub they have a charming food menu ranging from the classic macaroni cheese to traditionally raised pies and are also available for private hire. They often hold events and inspiring music performances so check their website for more information on what's going when you're staying with us. Of course, we should also mention how you can have a warm, cosy evening with a nice hearty meal simply at our apartments. 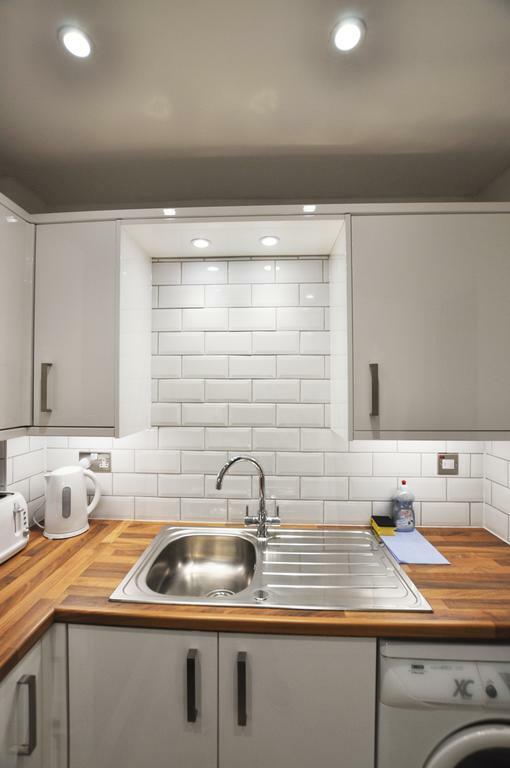 Our fully-equipped kitchens allow you to cook what you want and when you want it. We have the convenience store Tesco just outside of our apartments so you can stock up on ingredients, or Sainsbury's a little further on down the road. 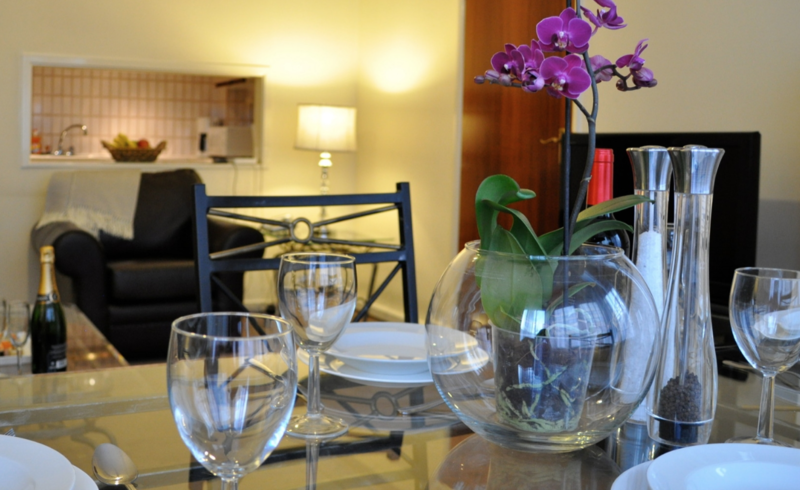 If you haven't already, don't miss your chance and book your high quality serviced apartments with us now. London is a superb city, there’s no doubt about it. Whether you’re travelling from abroad or in the UK looking for a domestic holiday this year, you’ll be sure to find something for you in London this autumn. Perhaps you’re looking for a little retreat before the hustle and bustle of Christmas, or just fancy enjoying the view of the golden-orange trees in the city – either way, London is a perfect choice. Are you, or a friend, a serious bookworm? Then you may enjoy the London Literature Festival at the Southbank Centre. Back for its eleventh year, this occasion will feature acclaimed authors, poets, speakers and collaborators for 20 days of wordy events. Featuring live readings, talks and workshops from the likes of author Philip Pullman, acclaimed photographer Annie Leibovitz and the Man Booker Prize nominees. At the end of October, Rebecca Solnit is doing a talk as part of this festival with A-lister Tom Hanks, who will be reading from his first published short story collection. Definitely not one to miss this autumn! Speaking of books, 20 years ago you may have been reading ‘Harry Potter and the Philosopher’s Stone’. Feeling old yet? Well, not to worry – this autumn you can embrace this fact in style with the British Library who are holding a celebratory exhibition – Harry Potter: A History of Magic – transforming each room around a Hogwarts subject. You can find out more on the British Library website. Maybe you need something to brighten yourself up a bit while preparing for the cold, so how about some jazz? Jumoké Fashola is a jazz performer and broadcaster hosting the Jazz Verse Jukebox at Hoxton Hall and at the EFG London Jazz Festival with her show Protest! Divas & Revolution. Fans of music and culture will truly enjoy watching this central figure to the London jazz scene. Of course, there are so many more events we could talk about. For example; Jimmy’s Winter Lodge is sporting a fondue lodge with igloos sat by the river; a Midnight Apothecary at the Brunel Museum Rooftop Garden – enjoy roasting marshmallows on a bonfire, pumpkin carving and cocktails; Fuller’s Brewery Tasting Tour; Nightspot Cinema at Archspace and the Buck’N Bull Saloon presenting Guy Fawke’s Friday. The list really goes on – and we’re convinced you’ll easily find something you love in London this autumn. Our apartments are ideally located in the centre of London nearby great transport networks making us a marvelous choice for those looking to enjoy these autumn events in the city. Book with us now and relax with the comfort of knowing you’ll be coming back to a warm, comfortable apartment. As our previous blog on deals you could get in London was a success, we thought we would take a look at a few more fantastic deals available in the city right this moment. Enjoy the ultimate thrill ride this Halloween with Thames Rockets through Visit London’s special offers. You can witness this adrenaline-packed spooky spectacular experience and tour this great city on the fastest speedboats on the river. The tour begins at the unmissable London Eye with gregarious guides ready to spice up your experience with an added personal touch. Comedians, actors and history know-it-alls will impress you with their peculiar stories of London. After you've passed under the iconic Tower Bridge all systems are go as you will cruise by at speeds of 30 knots. After you’ve built up all that adrenaline and return back to base, it’s time to enjoy a new trend – Whistle Punks Axe Throwing (over 18s only). After the safety briefing and learning the techniques, prepare for the tournament. It’ll be axeasolutely amazing. The discounted price for all of the above is available on the Visit London website until Tuesday 31st October. Our guests can take the tube from Tower Hill underground station to Westminster Station (roughly 26 minutes), and then a less-than-10-minute walk will take guests to the Thames Rockets boarding gates. Are you a fan of Chinese cuisine; maybe some aromatic duck, jasmine tea or exquisitely steamed dumplings? Well you’re in luck. Indulge in a varied menu of Eastern delights at Yauatcha City, sister restaurant to Yauatcha in Soho. With this star deal from Bookatable.co.uk guests can get a three course meal, a cocktail and tea for £34.00 per person. You’ll be wowed by the spectacular interior not to mention the great food or fine wines. This Chinese restaurant is one of the most highly-commended in the city. 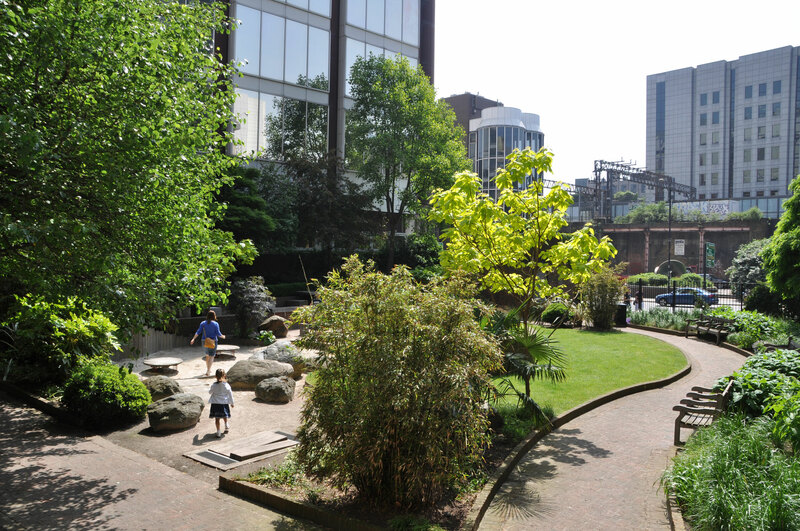 Guests at Marlyn Lodge can take a 12 minute tube ride from Aldgate East station to Liverpool Street Station, where Yauatcha City is just a 2 minutes’ walk away. We couldn’t go without mentioning a theatre deal, especially one to get you into that macabre mood for Halloween. A truly chilling tale of tragic secrets combining the intensity of a live performance with a film noir touch, The Woman in Black will leave you at the edge of your seat. You can save up to £15.00 on spine-tingling tickets with London Theatre Direct. To get there, our guests can take the underground from Aldgate East station to King’s Cross St. Pancras and then onward to Covent Garden, guests will then be 5 minutes away from Fortune Theatre. We hope you’ve enjoyed reading about some of the fantastic offers currently available in London right now, and don’t forget you can book great affordable accommodation with us online. 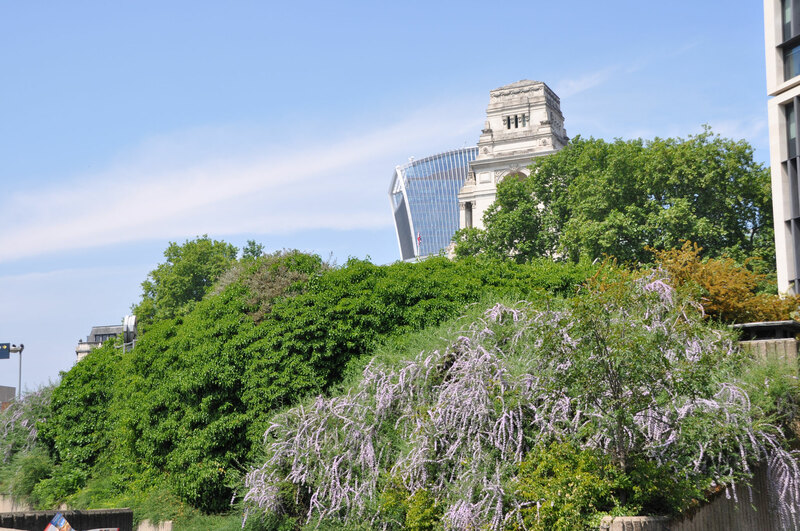 Perhaps you've read our previous blog and realised that booking with us is a great choice, and now that you've booked your apartment in a prime location of London, you might be looking for things to do around the area. Guests of our apartments are spoiled for choice as we're located near many popular sights and iconic buildings in London. We've previously looked into the HMS Belfast, some of the city's most charming churches, and other sights nearby but today we thought we would explore the Tower of London. The Tower of London is arguably one of the most famous sights in the city of London. If you're travelling through the city it would be a waste to miss visiting this historic castle. This grand structure is home to the Crown Jewels, the Royal Armories, the Bloody Tower and the Chapel of St. John. With nearly 3 million visitors last year alone, the Tower of London is one of the most popular tourist attractions in the whole country, and has been popular for a lot longer than most would presume; the Crown Jewels have been on public display for hundreds of years, dating back since 1669. Gaining steady popularity, visitor numbers grew so high that a purpose-built ticket office was built in 1851. 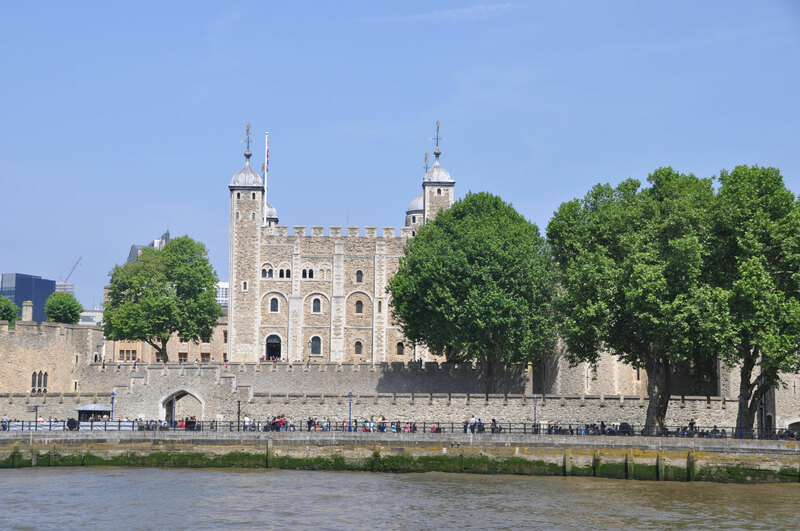 The Tower of London has previously served as a zoo, a prison (the Kray twins being the infamous last prisoners), an armoury and a Royal Palace. This historic sight is a fantastic choice for families, couples and individuals as it offers something for everyone. 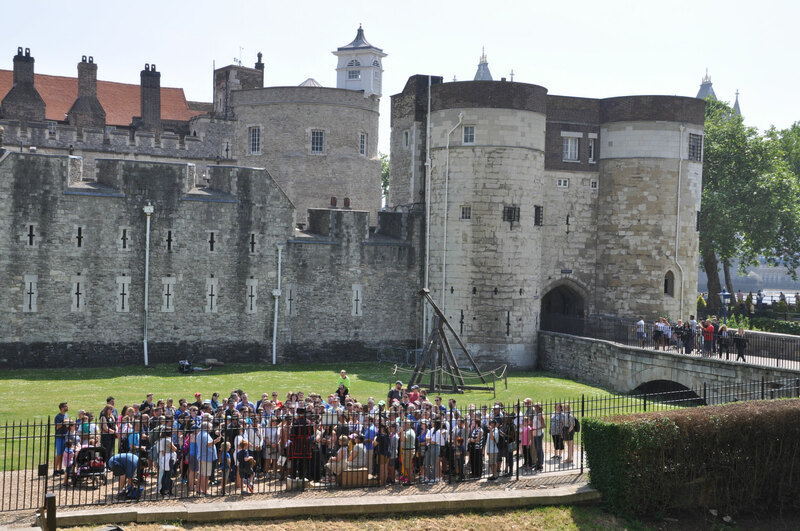 Those with a keen interest in English heritage will thoroughly enjoy learning about the tower's history, and there are often events and interactive experiences that all visitors can enjoy. For disabled guests, the Tower of London has dedicated facilities & tours with wheelchair hire available also. Visitors can even indulge in a meal or a light snack at one of their four eateries, or if you prefer, (and the weather allows!) 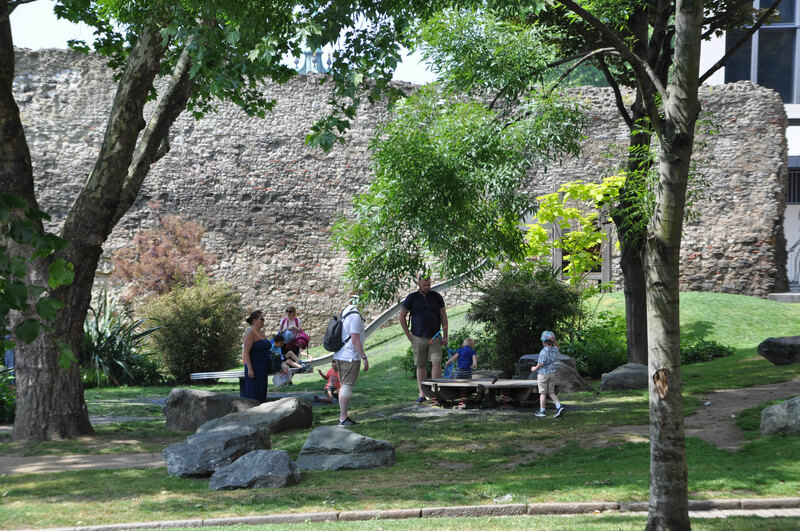 people are encouraged to bring a picnic on the grass of the Tower Moat. If anyone wants to have something to remember their experience by, feel free to shop for souvenirs, jewellery and gifts at one of their shops (non-EU residents can buy tax-free). Tickets online on the Historic Royal Palaces website are £21.50 for an adult and £9.70 for a child, and is always the cheaper option than buying tickets there on the day. If you've already purchased The London Pass you can get free entry to the Tower of London and a 10% discount in all the gift-shops, saving you time and money! Between Tuesday-Saturday the castle is open from 9:00-17:30 and from Sunday-Monday 10:00-17:30. 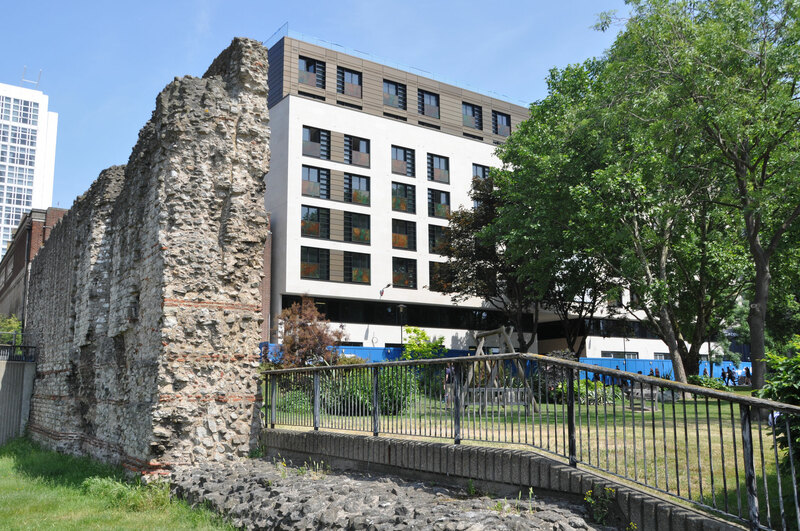 Finally, for those unfamiliar with the area, you might be wondering where you'll need to go from our apartments to get to the Tower of London... well, fear not - you may have already noticed it on your way to us! 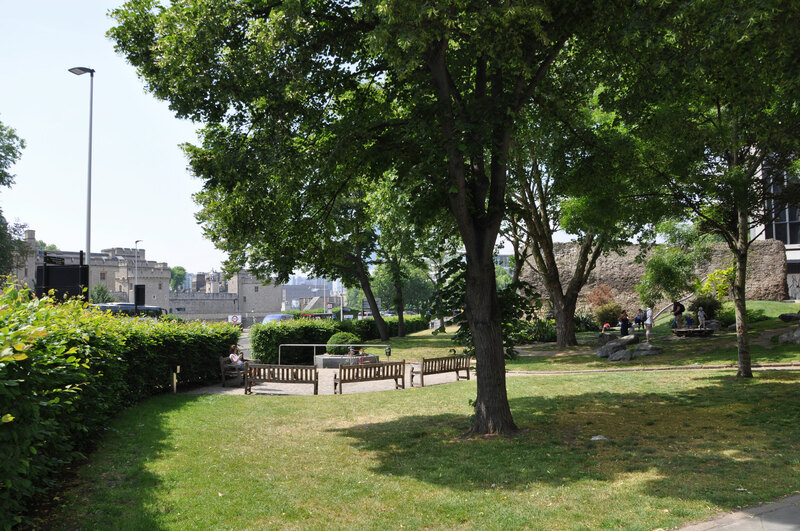 You can walk from our apartments to the Tower of London in around ten minutes. Click on our locations page for a map and more information on our area. We hope you manage to go and enjoy this fantastic sight and take full advantage of our great location. 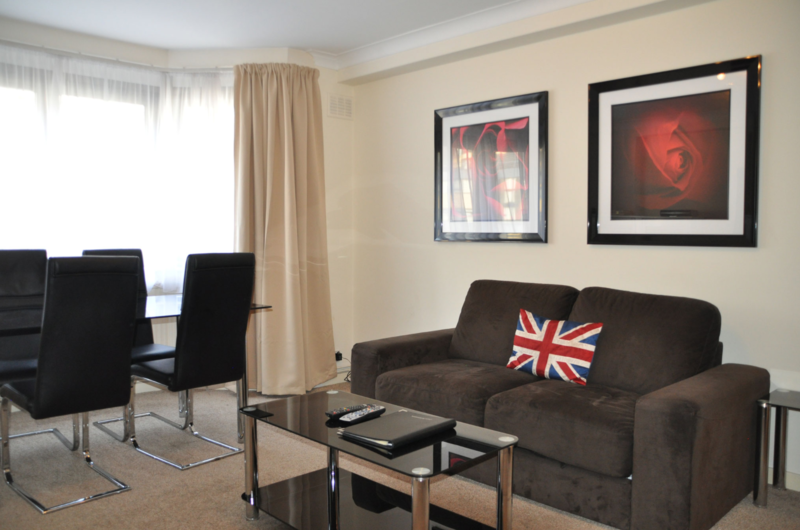 If you haven't booked your luxury serviced apartment with us yet, click here now for more information. 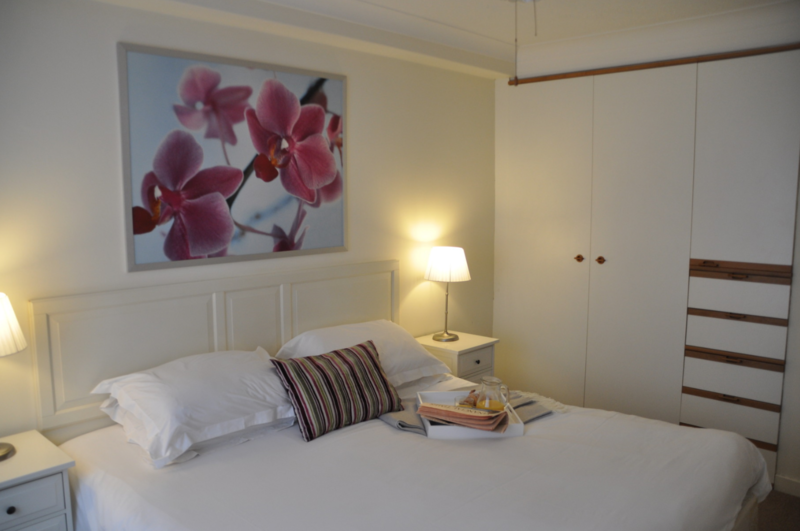 We hear it time after time - that "home-away-from-home" feeling is important to our guests, and we feel that we deliver. Whether you're staying in London for business or pleasure, it's vital that you feel as if you're living in the city itself rather than some indifferent hotel room with a lengthy check-in and check-out, (compared to our smooth and simple self check-in and check-out procedure!). 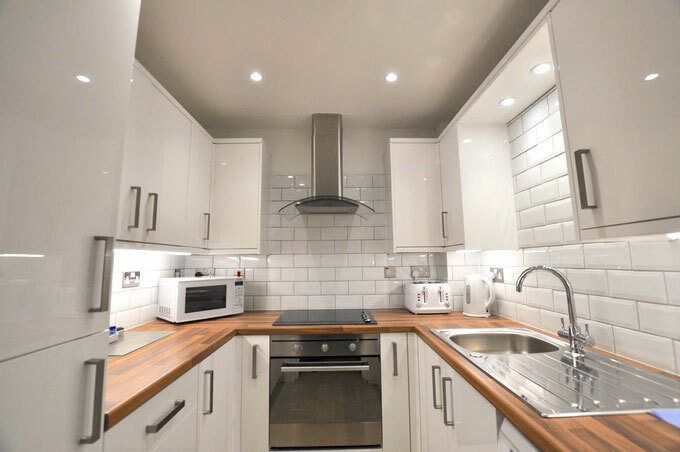 Our serviced apartments become your home for the duration of your stay; and you are right in the centre of this great city so you can go out and enjoy the area as locals do. You won't need to go to any tacky hotel bar when you have the centre of London to explore straight from your doorstep; with endless bars, restaurants and things to do all around you. Of course, comfort is vital. 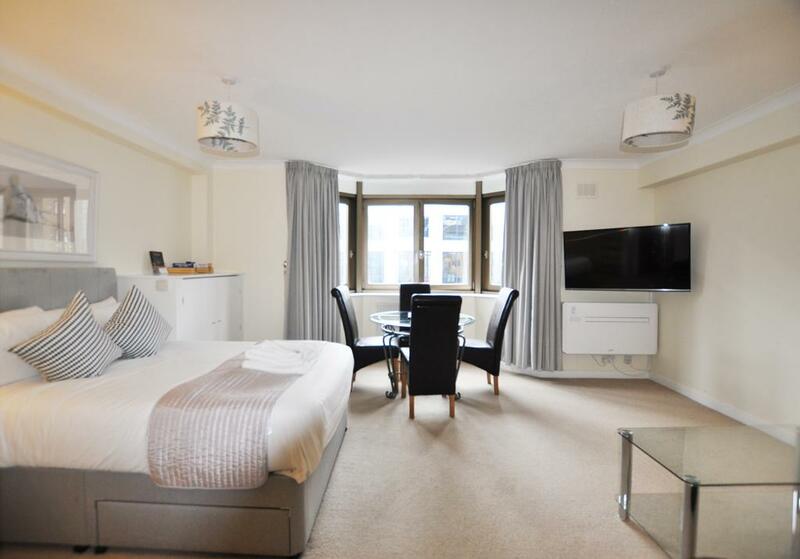 Hotel rooms on average are small - much smaller than your standard serviced apartment. And small definitely isn't always cozy. Hotels just can't offer you the relaxed breathing space that a serviced apartment can. 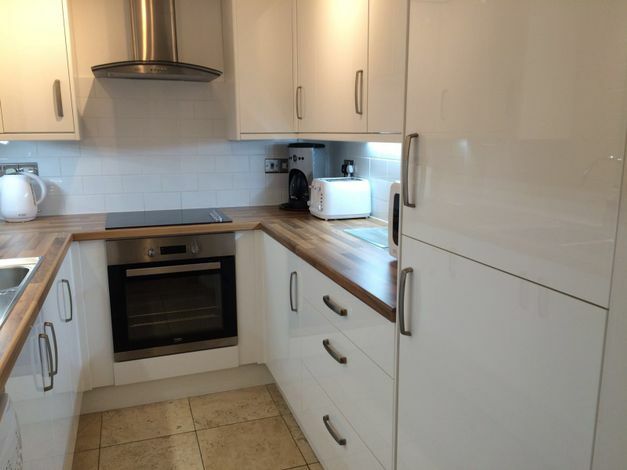 More often then not, in a hotel you would get a small cramped room with just a bathroom, but with our luxury serviced apartments you get a fully equipped kitchen, bathroom and a spacious, light bedroom. In our one-bedroom apartments you even get the comfort of a separate living room/dining area - perfect for both entertaining and business. You seldom get that kind of experience for an affordable price in a hotel. We even provide all the little important things that make all the difference, such as detergent for our washing machines (great for when staying with the kids or long stays! ), a free arrival package with coffee, tea, sugar, biscuits etc. and your own personal Wi-Fi at no extra cost. Every weekday we will replace your towels and toiletries, alongside making the beds, doing the washing up and a general tidy. For guests staying longer than 7 nights, we even include a weekly clean inclusive of the bathroom and kitchen. It's also important to remember that the price we show you is the price you pay. We have no hidden fees or charges like some hotels do. Any extras are clearly labeled as such because we believe that our guests should know exactly what they're paying for, making us also a perfect choice for business travellers on a company budget. We offer flexible dates and can accommodate guests for long periods of time, without racking up an expensive hotel bill. If you're not convinced yet, continue to explore our website for more information on what our luxury serviced apartments can offer you. And, if you agree that serviced accommodation is the best choice for you, book your stay with us now here. 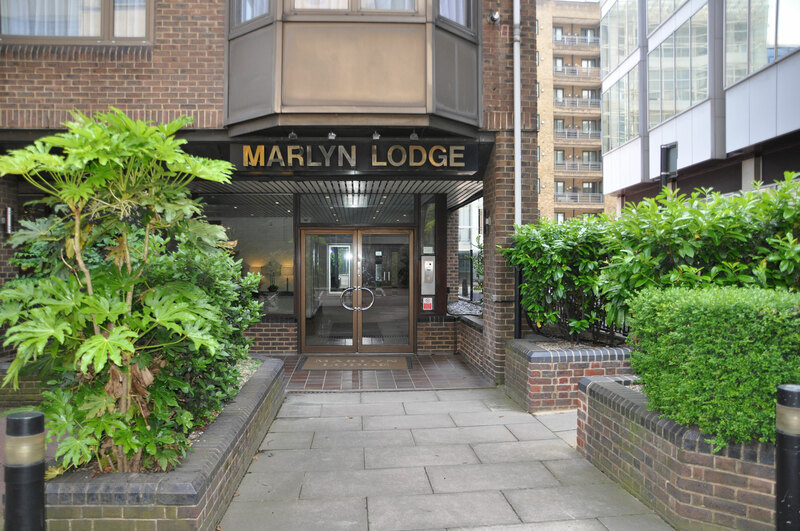 Here at Marlyn Lodge we always strive to improve and provide our guests with all the necessities required for a comfortable and affordable stay in the city. We always appreciate feedback and we listen to our guests, and in doing so we are proud to present two new little updates to our apartments! First of all, we now feature USB charging extension leads in all apartments. For our guests arriving from overseas with electronics charged by USB - you'll no longer have to worry about bringing an adapter for those gadgets - as you can now charge your USB electronics here at our apartments. Lastly, we now also provide detergent for the washing machines in our apartments. Definitely a great addition for those travelling with children or guests on longer stays, and it's one less thing for you to have to buy elsewhere! 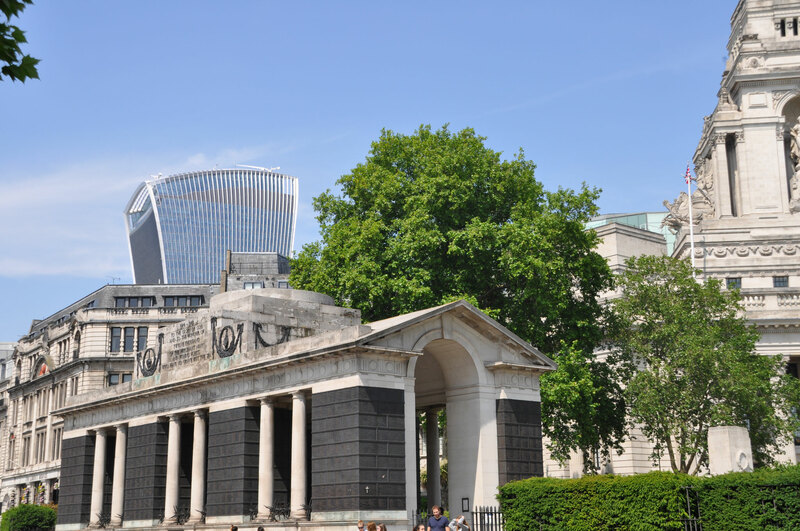 We hope you enjoy these small but mighty additions and keep checking our website for more updates and things to do in the grand City of London. With October just around the corner, we thought we would have a look into a few things spooky in London and get ourselves ready for that Halloween spirit. Thirst up, Queen of Hoxton is hosting a deadly special Dia De Los Muertos Death Day Party! Join them for a Mexican themed Day of the Dead carnival with crazy decor, spooky surprises and Grime and Bass music royalty Murlo & Slimzee. Get those sugar skulls painted on and dance the floor straight to hell. From 8pm - 3am on the 28th October from £5.00 per person. Buy tickets online for guaranteed entry on the Queen of Hoxton website. The venue is a twenty-minute walk from our apartments. As you may already know, our luxury serviced apartments have a perfect location in London, just by Tower Hill in Whitechapel - which has it's own haunting history. Over a hundred years ago the infamous murderer Jack the Ripper stalked the East Ends streets at night. You can find yourself transported back in time and discover a murder mystery with Jack the Ripper Tours. For £10.00 per person, meet outside Exit 4 of Aldgate East Underground Station - which is conveniently just around the corner from our apartments making this a fantastic and easy choice for guests looking to get the chills one October evening. This award-winning tour is at 7pm every night - true experts, visiting murder sites and locations related to the murders and Jack the Ripper, will guide you through this terrifying atmospheric experience. Though a more expensive option, for a more special and private experience, this particular tour company even offers a private chauffeur driven tour fitting around your schedule. Book online on their website now and you definitely won't be disappointed! Last but not feast, a good old fashion Halloween party is taking place high up at the Sky Garden on the 27th October 6pm - 2am. Fangtastic food and drink, Djs, live music and even a complimentary drink on arrival with Early Bird tickets, all from £25.00 per person. Book online at the Sky Garden website. Dress up in your most terrifying outfit and freak the night away - they promise to be bigger and better than ever before so be prepared to be thrilled! What's even better is that Sky Garden is just a ten-minute walk from Marlyn Lodge, so our guests can easily enjoy this event. Over 18s only and ID required. Visit the Sky Garden website for more information. We've mentioned just 3 of hundreds of events taking place in the city for Halloween this year. Keep checking back for future blogs that explore more great things to do in London in the upcoming weeks. Remember, you'll be hard-pressed to find great quality serviced accommodation in a better location - so don't miss out - book with us now! London doesn't always have to be an expensive city, there are many great websites out there where you can find fantastic deals for things to do and see in the area. We think our guests will appreciate some the following offers and deals we've found that you can get right now. A Silent Disco at Sea Life London Aquarium - Featuring a new immersive jellyfish experience you can go and enjoy a silent disco under the sea (well, as close as you can get!). For £29.00 you will receive a welcome drink on arrival, entry to the jelly tour and you can dance the waves away with headphones. Over 18s only. From our apartments, guests can get the underground from Tower Hill station to Westminster (roughly 11 minutes) and then take a short walk to Sea Life London Aquarium. Fillet steak, chips and a glass of Malbec for £25.00 per person at 'Smiths' of Smithfield. For those looking for some fine dining; a short tube ride from Aldgate East to Farringdon station will take you a 4 minute walk away from this modern British restaurant. Enjoy stunning top floor views of London with floor-to-ceiling windows. The view from The Shard - Kids go free during October half-term! Experience the Capital's glorious skyline from the top of London's tallest attraction. 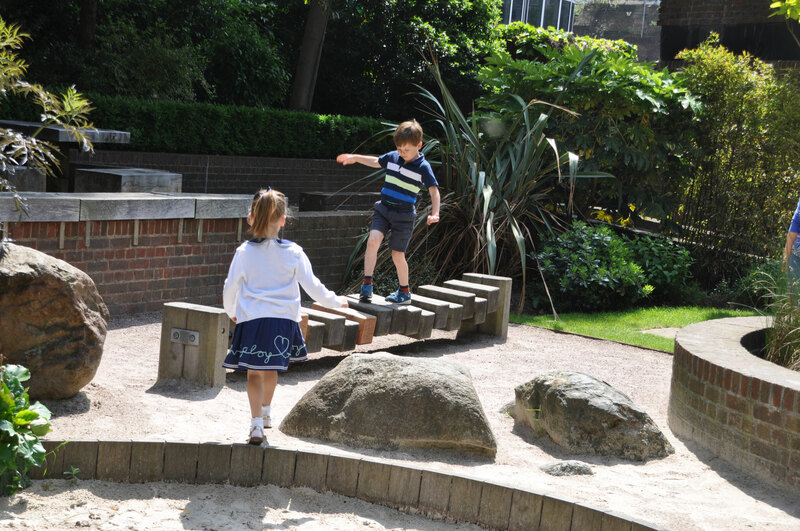 The Shard is great for children and adults alike with bars, restaurants and shops to explore. From £25.95 this is a great opportunity to view many of London's most iconic buildings. 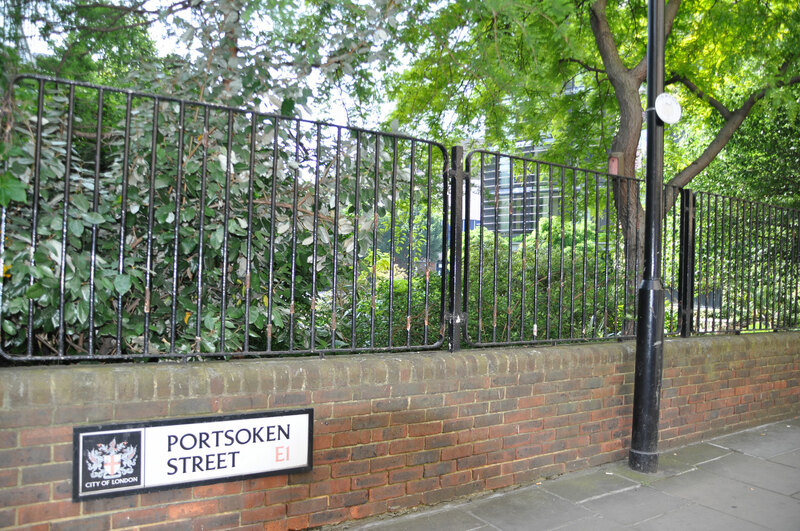 Our guests can take a scenic 25 minute walk from our apartments to The Shard. Shrek's Adventure - Perfect for the family, you can save time and money with this offer. Enjoy a hilarious adventure to the land of Far Far Away with Shrek and his friends, including a magical 4D bus ride, sets from the film franchise, fairytale themed shows and more. With this offer, visitors are guaranteed entry within 45 minutes of arrival. Guests can get the underground from Tower Hill station to Westminster where they will be a short distance from the Riverside Buidling. Last but not least, for theatre lovers, you can get a free upgrade to Wicked the Musical with this deal. Based on the best-selling novel by Gregory Maguire, this musical recreates the stories and characters in the classic 'The Wonderful Wizard of Oz'. Recommended for ages 7+ this is also a great choice for families. We hope you can take advantage of the above offers and deals, and if not, you can be sure to find more online that you may enjoy. 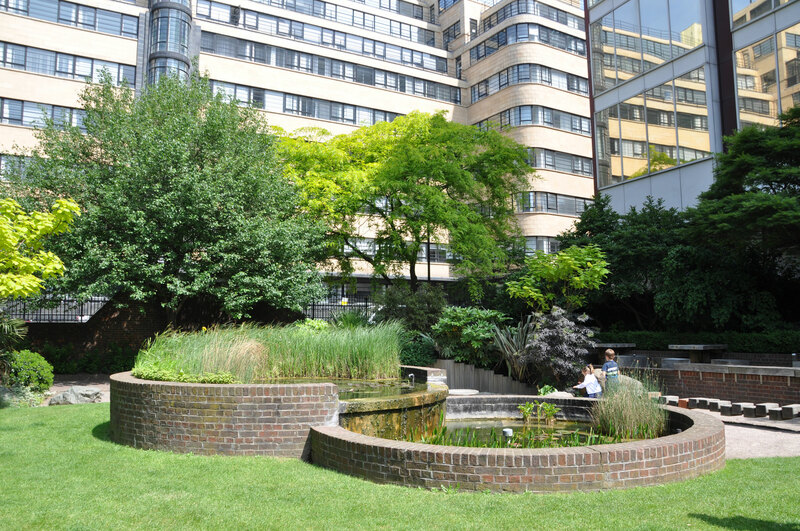 Don't forget, our superb location in the City of London is a great homebase for you to enjoy the Capital. So if you haven't already, book with us now!